…peaches for free. Well, not quite millions or exactly free but close enough. Our tree is heavy with fruit this year. Since the blossoms became buds, we’ve been throwing out plans for the crop. This weekend we picked our first round. Each year around Memorial Day, Central Texas is in full peach swing. My husband likes to make peach daiquiris and always requests cobbler. I like them fresh in a salad or alone. 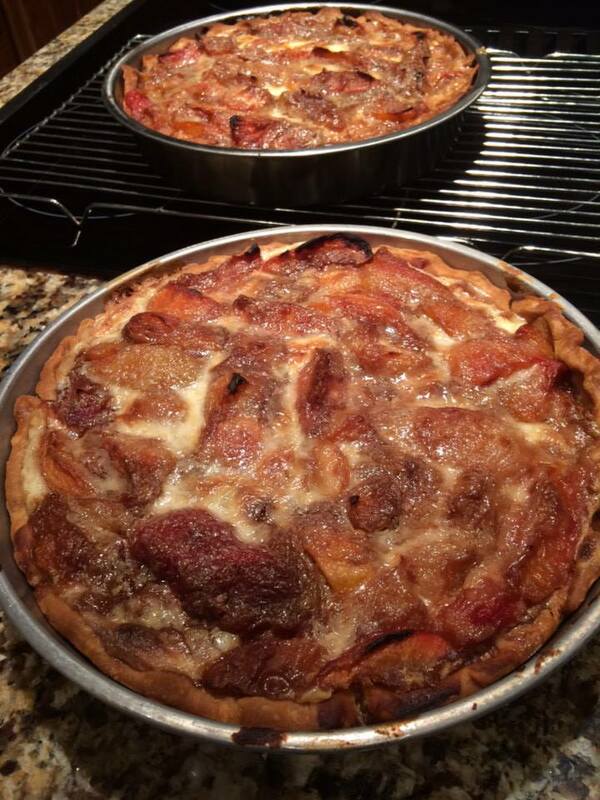 But my all time favorite peach recipe is my mom’s peach pie. I don’t know where the recipe originated but I do know that it has inspired a few spontaneous marriage proposals. I made it for my neighbor twenty years ago and it is still a tradition for her and her daughters. It was always my birthday dessert of choice and one I can’t resist. One crust, the biggest challenge is peeling the peaches. If you give them a quick dip in boiling water, the skins slip right off. Toss the peaches in an easy mixture, pour over cream and bake. Simple and impressive, the best kind of dessert. And since you’ve no doubt got the Presidents song running through your head, I’ve included it below. Cheers! Pour 1/2 tsp of almond extract in a 1 cup of heavy cream. Pour cream over the peaches and bake at 400 for 45 minutes. Love peaches! Thanks for the pie recipe. I’ll have to try it. I spent many summers with my grandma in Georgia picking peaches & eating cobbler. She would also slice up fresh Georgia peaches & pour condensed milk in them as a bed time snack! Yum! By far, the best pie!